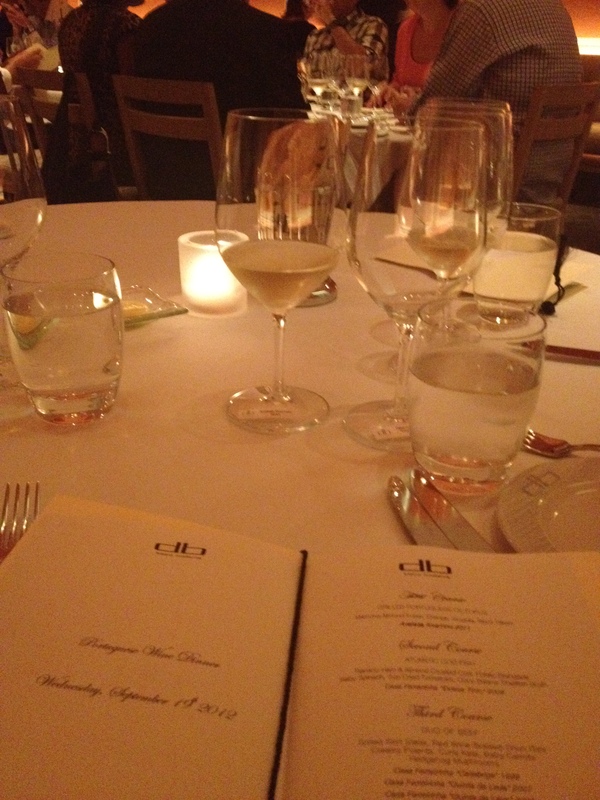 in new york, a few weeks ago, with friends, a bit after 10:30 pm, i was enjoying my luvFAB Jacques–Selosse and ordering all the appetizers at Boulud Sud. in the past weeks, i seem to be fancying multiple venue restaurants in multiple cities, as last night we were at DB Bistro Moderne Miami. in this case though, it might altogether be, that both of these venues offer something different and their wine lists and menus are quite interesting. Boulud Sud, the newest cuisine concept of The Dinex Group, has been opened for about a year, and still feels quite fresh. flavourful and fresh, describes rather well the varied mediterranean yummy cuisine. that night, Daniel Boulud walked in with a radiant smile, and as he approached our table, it struck me that his enthusiasm reflected the mediterranean cuisine this restaurant was serving. it is refreshing, notwithstanding his many venues, that he still keeps intact that level of excitement. this upbeat energy is just what any restaurant should exude. i had the same impression last night, at a portuguese wine tasting dinner at DB Bistro Moderne Miami, another venue of The Dinex Group. different and interesting was the evening. portugal is not on my radar, and wanting to enjoy the experience, i succumbed to this wine tasting dinner with unguarded enthusiasm. sommelier christopher lindemann, served as the aperitif, a crisp and citrusy 2010 Aveleda Fonte vinho verde, and this white wine was a charmer. my dear friend jim was skeptical that i was enjoying this wine, as he knows that my simple taste is altogether too complicated, so he clicked his wine app and with a wicked smile, showed me the under $10.00 price range. price indeed can affect your perception; be on guard not to make this a rule and keep an open perspective. portugal has integrated modern wine making techniques and as a result portuguese wines have greatly evolved. another surprise was Casa Ferreirinha Douro Callabriga 1999, a delicious, fruit forward and well structured red wine. sergio caceres, one of the managers, was beaming, as we were savouring the outstanding portuguese menu that chef matthieu godard, who recently joined the miami venue, prepared with quality ingredients that emphasized the flavours of this cuisine. it is exciting to keep multiple choices open; these multiple venues are exceptional choices for thebestdressup now! the portuguese wines were a luvFIND at the DB Bistro Moderne Miami portuguese wine tasting dinner. 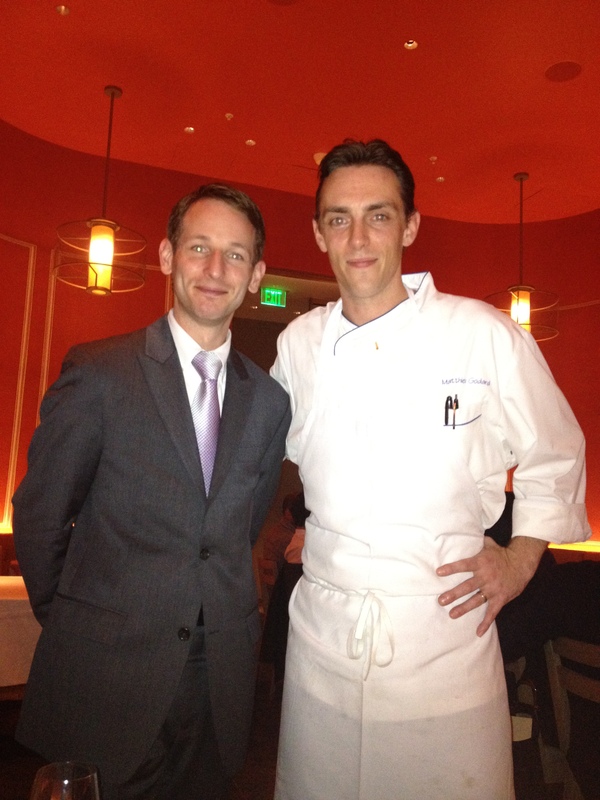 sommelier christopher lindemann and chef matthieu goddard are beaming with enthusiasm at DB Bistro Moderne Miami. this multiple venue is a luvFAB for thebestdressup now! This entry was posted in FOOD, luvFAB, luvFIND, PEOPLE, RESTAURANT, TRAVEL, WINE and tagged AVELEDA FONTE VINHO VERDE, BOULUD SUD, CASA FERREIRINHA DUORO CALLABRIGA, DANIEL BOULUD, DB BISTRO MODERNE MIAMI, JAQUES SELOSSE, MIAMI, NEW YORK, PORTUGAL. Bookmark the permalink.